► UMB Community Meeting: this Wednesday, April 18, from 12 to 2pm in Campus Center Ballroom A. We will be discussing the UMass Mt. 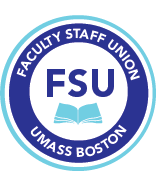 Ida Acquisition, parking fee increases, budget cuts to Centers and Institutes, and providing debt relief to UMB, and on how we can Stand up for UMass Boston at this key juncture. Let us know if you are willing to say a two-minute testimonial on any of these issues. The FSU Event Page for this is here. Please attend! The Board of Higher Education will be meeting on this on Tuesday, April 24. You will be able to give public comment at this meeting, and we hope you do. We have yet to hear back on the specific role of this Board in this purchase but hear that this will be defined for them at this meeting. The Senate will hold hearings on this as well (see here for more). We will inform you when we have more information on all of these. See articles here, here, here, and here on this issue. We will keep you informed on what you can do and what we will be doing in coalition with others. Please let us know your concerns as well. ►Parking bargaining: Let us know If you are willing to give testimony in bargaining on how their proposed parking fee increase will impact you or your students. For those of you opposing the parking fee increase who have yet to do so, please sign and circulate this petition here. ► RES Funds: You should have heard by now the amount you should be receiving. The FSU Annual Meeting will be on Wednesday, May 2nd, 12 noon (room to be determined). We will send an agenda and post this online. The Massachusetts Teachers Association (MTA) Annual meeting is Friday and Saturday, May 4-5, 2018, at the Hynes Convention Center, Boston, MA. We will be electing the President and Vice-President of the MTA, and are looking to fill our slate of 16 delegates plus alternates. Voting for these positions will occur on Saturday, May 5. Let the FSU know if you want to be a delegate or alternate, should a delegate be unable to attend (see here for more information). The elected leaders of MTA make a difference, so we encourage you to participate.